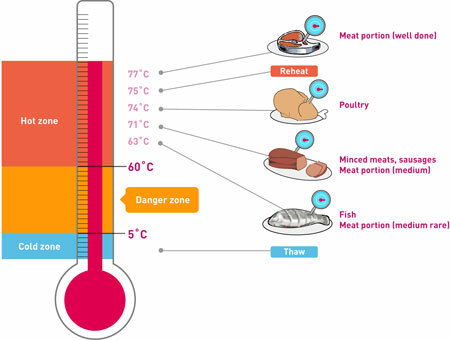 Always use a food thermometer to ensure that food has reached a high enough temperature to destroy harmful bacteria. Here are the internal temperatures recommended by the USDA Food. Thaw frozen foods in the refrigerator. You can also thaw foods by placing the item in a leak proof plastic bag and immersing it in cold tap water in the sink. Every half hour, change the water to keep it cold and turn the food over if it’s not fully submerged.